Astrology of Sedna - Neptune square 2006 to 2008. Dwarf planets and Trans personal planets. TNO`s. 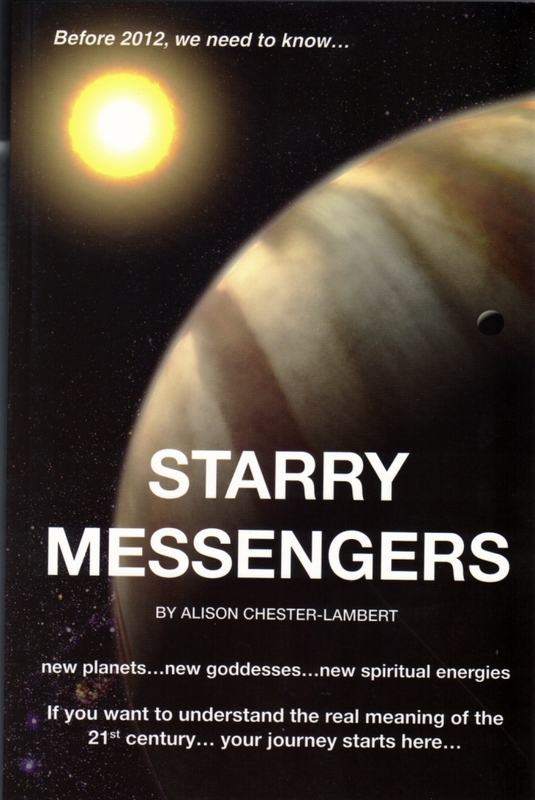 Astrologer Alison Chester-Lambert. It is interesting to see how the meaning of the recently discovered dwarf planets of the Kuiper Belt and Trans Neptunian Objects (TNO`s) is unfolding in the 21st century. One thing that is becoming obvious is how the old transpersonal planets, Uranus, Neptune and Pluto, are bringing out the meaning of the TNOs. Pluto and Uranus awakened or revealed Makemake`s energy in 2005 and 2009, and certainly Neptune was a catalyst to Sedna during their long transiting square from 2006 until 2008. It is also becoming obvious to the interested observer that the TNO`s are taking it in turn to emerge into collective consciousness and Sedna seems to have been one of the first. You will need to have read the previous article on Sedna, called “Sedna and Floods”, before reading this one. 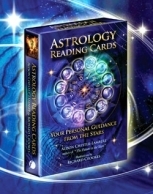 It was written for non-astrologers, but it contains the essential background that allows astrological understanding. This article is concerned with Sedna as a planetary and collective energy and does not attempt to interpret Sedna's effect on natal charts. (Although if pushed, I would simply say that she seems to make people strongly aware and fearful of weather and planetary protection issues.) I have studied Sedna with regard to her interaction with other transiting planets and as a result feel confident enough to comment on those. In this respect I have watched for the issues and events that have affected nations and populations rather than individuals. Having a few more planets of a collective nature is making this type of mundane astrology richer and more fruitful because we have more to look at and more meanings and relationships to take into account. Hence there is more to understand and predict with. It's like Monopoly with 4 more streets added. Prediction involving Sedna is relatively easy since she represents a few quite specific things. Namely watery weather events, such as heavy rainfall resulting in flooding, hurricanes and perhaps tsunamis. She also represents the collective concerns and actions regarding polar climate change. After that you simply need to understand how the Moon, Sun and Mars trigger transpersonal transits i.e.when any of these conjuncts, squares or opposes either end of the transiting aspect, events and issues occur. In natal astrology this principle applies to outer planet transits to a natal chart point – the transiting outer planet does not have to be within 1 degree – so long as it is in a period of engagement - that is - within the period of 3 or 5 hits, this rule will apply, albeit the manifestation is stronger when there is a 1 degree orb all round. The TNO’s have a similar rules to understand before you can predict the timing of events. But this time it is not a natal planet receiving an update or service pack. There is something different going on. Sedna's energy waves are coming through the ether, flavoured by the zodiacal energy they travel through to get to us. They mix or interact with the energy waves coming at us from another direction, from another planet. The energy from this other planet causes an interruption or reaction and energy is released. The released energy, the event or outcome, will be the result of the mix of the two planetary energies. So long as we know what to expect from one planet, we can attribute the remaining energy to the unknown one and work out what it means. Easy huh? Then apply the rule that the Sun, Moon and Mars will energise and produce results when they also get within one degree and it simply becomes a matter of observation and analysis. The Sun and Mars will also light up Sedna’s meaning when individually aspecting her. She was discovered by Brown et al on 14th November 2003 as transiting Sun opposed her and officially announced to the world on 15th March 2004,10 days after transiting Mars conjuncted her. Using this kind of accuracy as a guide, the tsunami of 2004, which I have previously attributed to her, may not actually be anything to do with her. Certainly on that day she was not in contact with any other planet. In fact the dwarf planet most likely involved with the tsunami is Makemake, who was within 1 degree orb of a square with Pluto-Charon, and had transiting Moon putting him into a T-square; plus he has a history of tsunami involvement and mass de-population from Easter Island. However, he still hadn’t been discovered at that time, so Sedna had been the obvious candidate. To be honest, the jury is still out; it is certainly too soon to make absolute and convinced statements based on the evidence of transits and event accuracy occurring over 4 years. However, I will say that I often get the feeling that I am working with rules that are accurate enough and will apply for now, even if they morph into different patterns after a few decades. Transits and Events from 2004 Onwards, Anticipating Egg on Face! So, as it appears that I am quite happy to have egg all over my face and a reputation in tatters, let’s have a look a Sedna’s transiting exploits and match them up with world events. To do this, I have a rule! If the event is featured on Sky news headlines then it counts as valid and appropriate. I will not accept any events that do not. Otherwise, it could be said that I could dig around world news and find a storm or hurricane somewhere on the planet at any given time. If the event is big enough to be on Sky news headlines in England, then it is a world weather event that counts. Our story begins in 2004 and trust me when I say that, as strange as his may seem now, before then, no-one except un-published scientists and hippies left over from the Greenham Common protests had heard of global warming! Looking at where we are now this is hard to believe, but it is true. 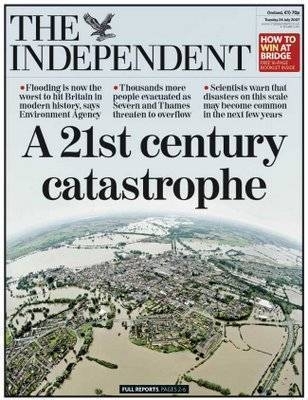 However, front-page newspaper reports written in 2006¹ documented the physical evidence of 2004 and it was devastating. There had been a great and accelerated loss of usually permanent Artic ice. It had shrunk by 14% in just a few months between 2004 and 2005. That is compared to an average of 0.15% per year since records began in 1979. The melt rate had got 30 times faster in 1 year. The overall loss amounted to an area the size of Turkey and it had gone. Although Sedna had been discovered, and there is no doubt now that this was synchronous with the massive melt down, we knew nothing of it until 2006 and likewise there were no significant transits to her until 2006. 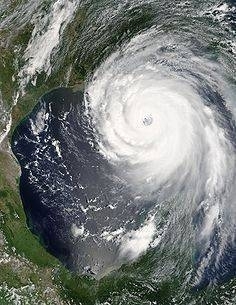 However, we do have to account for hurricane Katrina, an event that ranks as one of the largest natural disasters in the history of the United States. This unfolded as transiting Mars and Moon went conjunct 5 degrees before Sedna at 14/15 degrees of Taurus on the 25/8/2005, the day the hurricane formed. Things got worse as Mars came within 2 degrees of Sedna on the 29th and Katrina made land at New Orleans. More levees failed and the floodwater rose higher after the hurricane had dissipated and Mars passed in front of Sedna. Storm surge floods and tornadoes continued for a couple of days afterwards. It seems funny to think that Mars/Moon/Sedna can get together and cause all that, but it is relative to the context of the sensitive first couple of years of Sedna’s emergence from the closet and it adds to other research for later years. In general, the weather was starting to become noticeable all over the world and the ice was melting 30 times faster. Katrina was Sedna's first big performance and she only needed the Moon and Mars to launch her. The transiting square from Neptune to Sedna began in February 2006 and parted company in December 2008. During those 3 years all the action took place on the fixed cross between 18 and 22 degrees of Taurus (Sedna) and Neptune (Aquarius). A film called the “Inconvenient Truth” starring Al Gore was released in the States as Sedna and Neptune were exactly square at 19ish degrees. Until then, America, led by George Bush, was in denial about global warming. He had even withdrawn America from the Kyoto Treaty that would have bound them to lowering CO2 emissions. Saturn arrives at 19 degrees and puts Sedna in a T-square. Pertinent global warming reports were released and finally fear and realisation hit the world media. This was the month it really started to take off and “global warming” became a familiar term. Saturn makes his 2nd hit to 19 degrees and is joined by the Moon. On this day the International Council for Science and the World Meteorological Organization announced the beginning of the International Polar Year initiative², a large scientific programme focused on the Arctic and the Antarctic from March 2007 to March 2009. This programme would be instrumental in getting world governments to pay attention to the crisis. Saturn was putting formal structure and government involvement against Sedna’s own climate change programme. You can find the results of their investigations on their web site, www.ipy.org, but basically it talks about unprecedented cataclysmic warming and loss of snow fall. Now we get to the last 2 summers and to start with, just ask yourself if you noticed anything about the summer weather of 2007 and 2008? 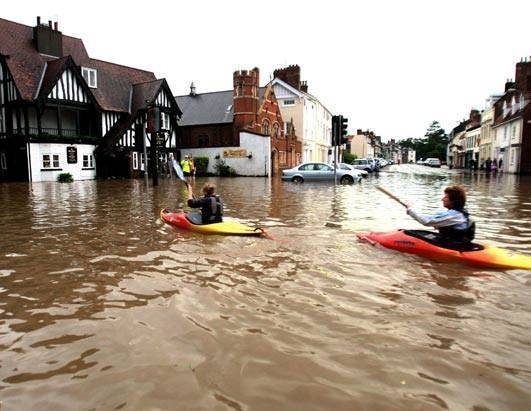 Most people in England did notice that it rained…….a lot! The T-square between Saturn, Sedna and Neptune stayed in place from March through to June and every time the Moon, Sun or Mars got to it the heavens opened. Double the normal frequency of rain fell in Asia4 with 10 million people displaced. Snow and the first cyclone ever hit Saudi Arabia. Heavy rains and flooding ravaged southern China. Etc. "In England and Wales the period May to July in 2007 was the wettest (406 mm) since records began in 1766, breaking the previous record of 349 mm in 1789. The extreme rainfall in June, with 103.1 mm of rain recorded in 24 hours during 24-25 June in northeast England, was followed by a similar event with 120.8 mm of rain on 20 July in central England. Both events resulted in extensive flooding across parts of England and Wales." On the 20th July, Sedna and Neptune were both at 21 degrees and Mars was at 18 Taurus. (Saturn had now moved on.) Four days later Sedna and Neptune are obviously still there, Mars is at 21 degrees of Taurus and the Moon is at 21 degrees of Scorpio. A month’s worth of rain fell in an hour and still it kept coming. The crops were going to rot in the fields and it seemed as if nothing could save them. Then the strangest of things happened, and it still makes my hairs stand on end when I think of it. On August 13th there was a new Moon at 20 degrees Leo, which would normally have symbolised greater flooding, but not in this case. Ceres, the Great Mother Earth goddess of grain and crops reached 20 degrees Taurus and she stood between Sedna and the Earth. Miraculously the rain stopped, the Sun came out and the fields dried out. But more than this Ceres was slowing. She inched her way to 24 degrees whilst still holding back Sedna and then turned retrograde. The crops were saved. In fact she continued to hold back Sedna until the end of October when she finally lost her grip as she slipped back past 19 degrees of Taurus. I have never seen anything like it. It was an amazing demonstration of her new power since she was raised in status from asteroid to Dwarf planet, and what a timely promotion! Whilst the above was going on in England, both China and India were also suffering devastating and unprecedented floods. Then in 2008, We Get it All Again! I think I hardly need to remind you that in 2008 we faced it all again, and still the cycle reflected the Sun, Moon and Mars transits to Sedna and Neptune. By this time I was predicting floods with precise accuracy and local people were asking me when to book their holidays! The Moon was at 21 degrees Taurus and yet again there was a severe storm. It had once been hurricane Joanna and it caused damage and widespread flooding to parts of England in 95mph winds. 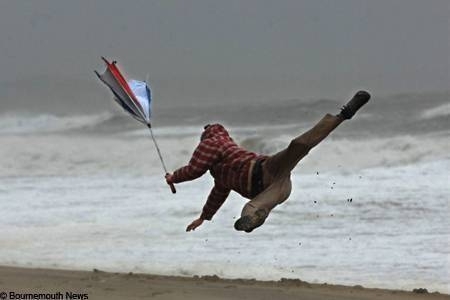 Someone had caught a super photo of a man being wiped sideways off his feet whilst still hanging on to his inside out umbrella, and this made the front page of all the papers. It was Flood Safety Week in America and ironically the Midwest had widespread and severe flooding. The Moon was at 21 Leo on the 18th. Ok, the Moon is on that cross once a week, but she seems to coincide with the worst of the rain rather than the worst of the flooding, which lasts much longer. It still seems very synchronous when you look at the bigger picture. 14 – 17 August 2008. Severe flooding Ireland and Scotland. Sun and Moon at 21 Leo and 21 Aquarius. Neptune 23 degrees and Sedna at 22 degrees. 5 - 6 September 2008. Prolonged heavy rainfall to many areas, especially south-west England, Wales, south-west Midlands and north-east England. Moon at 22 Scorpio on 5th, Neptune and Sedna both at 22 degrees. Ok, that just about does it, I will re-iterate that I only used the rains and floods that made the headlines on Sky news, but there were loads more that collectively made it a very unusual year for rainfall. For further evidence that the square between Neptune and Sedna was signifying rainfall and then floods, I look to this year – 2009. They have long since split up….and what has happened to the weather? Well, in England it has been fabulous! We haven't had any rain. In fact there are now warnings that it is too hot too soon and we may well be running short of water……. Neptune represents such mundane, worldly things as addiction, fashion and the film industry, compassion and redemption and the Ether (an invisible `dark' medium, energy or fluid everything exists in). He also represents ethereal, subjective, soulful `feeling` things, such as pining, yearning and longing. Feelings of loss or euphoria and the emptiness of reaching for something that is always just out of reach. Something elusive, mystical, sublime and delicate. Neptune represents the Great White Light and dreams of fusion in a perfect world of love and ecstatic blissed-out one-ness. Neptune is dreamy oblivion. OK, we know all that and none of it was particularly apparent during the square, except perhaps it did become fashionable to get serious about climate change! But obviously Neptune is also a water planet and will literally represent water including oceans and flooding. Those receiving a Neptune transit will always feel like they are drowning or being overwhelmed and if you have a Neptune transit you should get into water. But by himself he would not have signified as much rain as that. He has been known to us for a couple of hundred years and the weather of 2007/08, as it states above, was unprecedented. And he has never been associated with global warming or climate change. Perhaps his effect on Sedna was to loosen her energy and she became boundary-less and unlimited under his influence, surging and overflowing without restriction. Perhaps he did what he always does in transits to natal chart points - he softened, confused and 'mushed' her. Certainly he tends to dissolve things, be it resolve, energy, security or will power. Then there is Sedna's effect on Neptune to consider. Maybe her stuff just made him 'cry' for 2 years! The square from her 'squeezed' a compassionate watery, flooding response from him. All things considered whilst being thumb-screwed down to make a definate statement, I'm inclined at this point to think that Sedna represents rain and snowfall and Neptune represented the resulting floods. We'll have to see. Addendum May 9th 2009 We have just had a full Moon very close to Sedna's position, (19ish degrees of the Taurus/Scorpio axis. Sedna is at 21 Taurus) and there was a programme on channel 5 about the Canadian artic which marked the begining of Polar Bear Week - a nice co-incidence I thought!